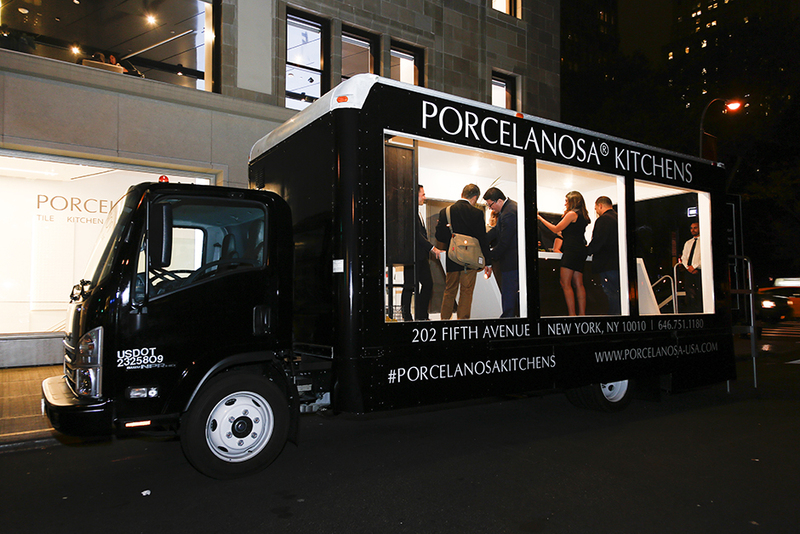 On Wednesday, October 19, 2016, Porcelanosa launched its mobile kitchen showcase. 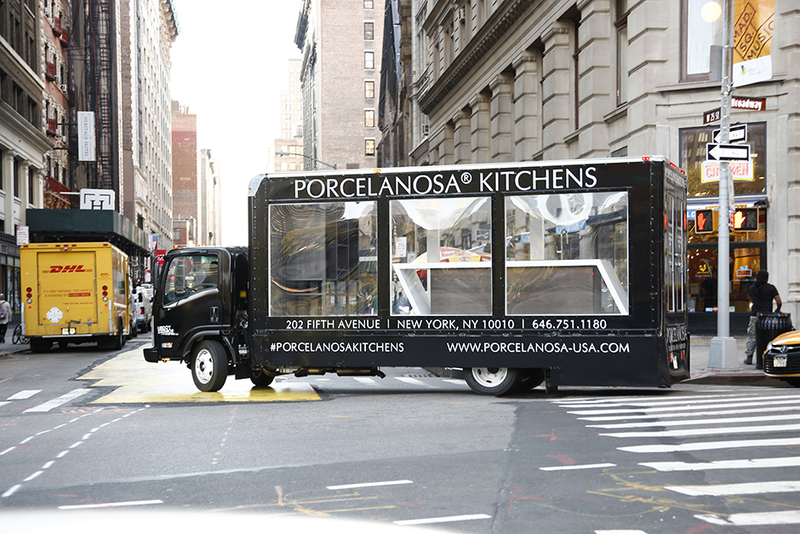 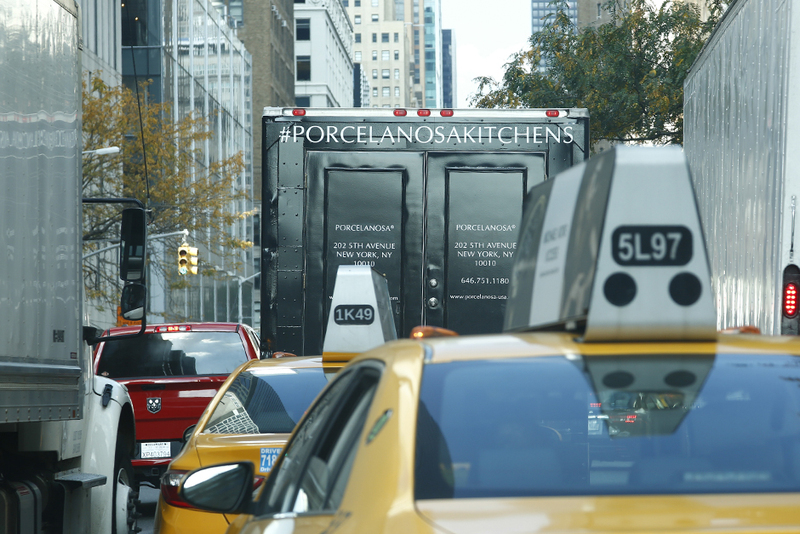 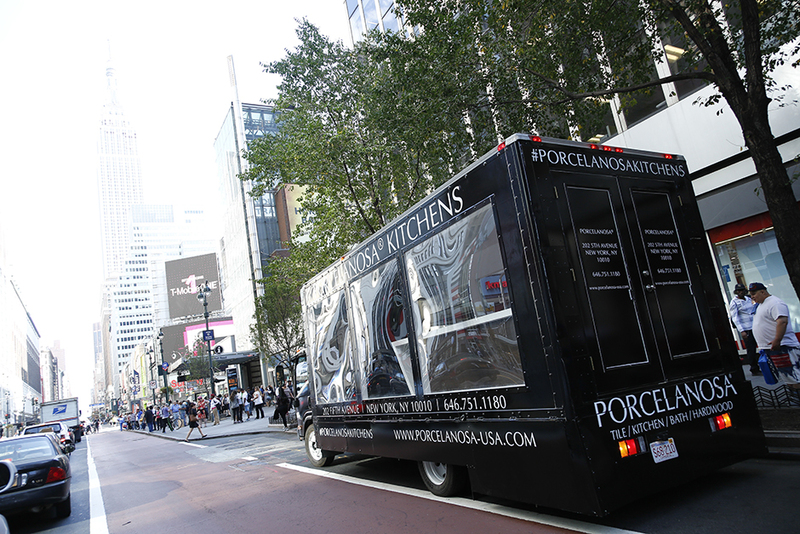 A custom truck showcasing a Porcelanosa kitchen traveled through the busy city streets of New York City, stopping at major intersections to give out branded giveaways and marketing materials. 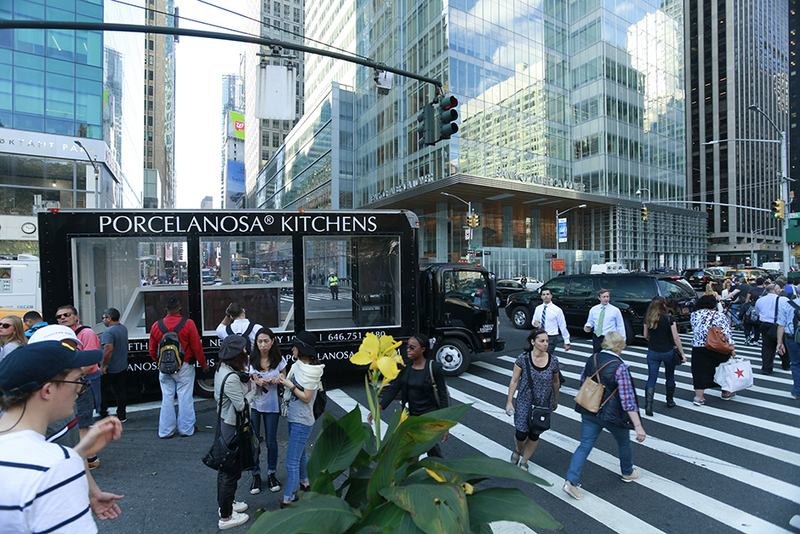 The vehicle, encased in glass on both sides, started the campaign parked at the flagship store at 202 Fifth Avenue, amidst gawking spectators. 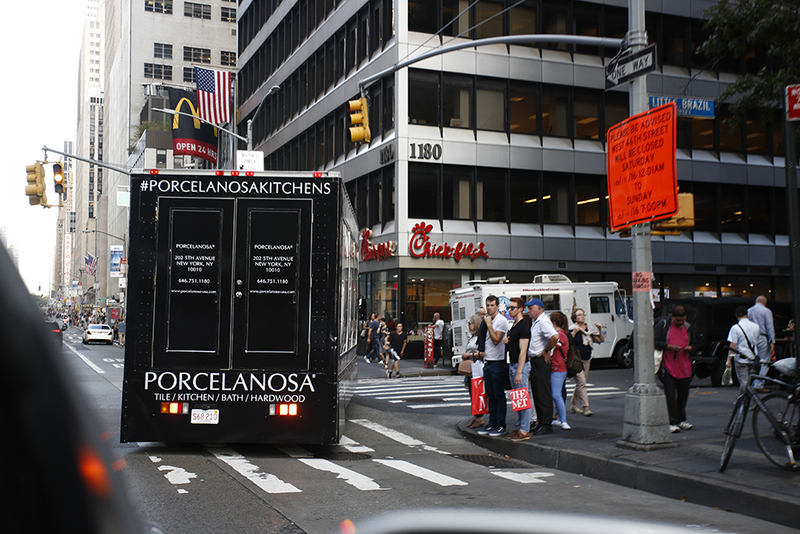 It then traveled up and down Broadway between 1-2 PM, Fifth Avenue between 2-3PM, Park Avenue between 3-4PM, and finally finished up the route in Times Square. 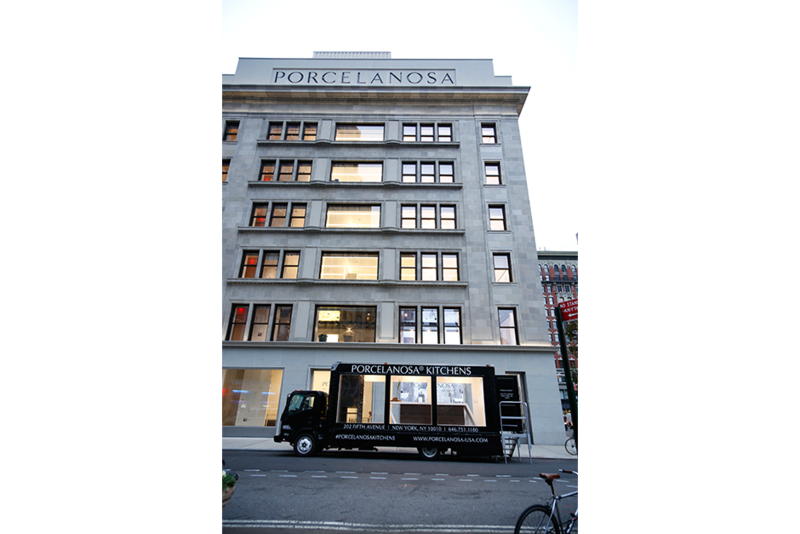 The truck route was posted on Porcelanosa’s social media pages, encouraging followers to post a photo of the truck along with the hashtag #PorcelanosaKitchens in order to be entered to win one of five $1,000 Porcelanosa gift cards. 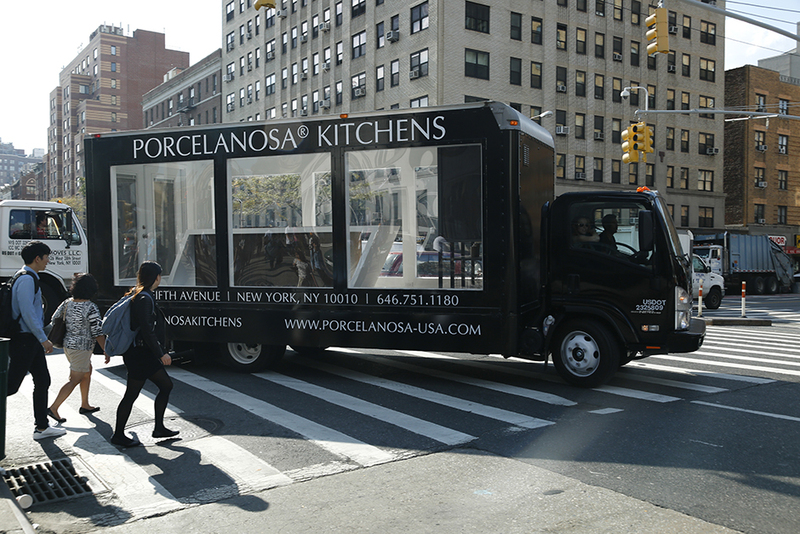 The kitchen featured in the truck was a kitchen from the Emotions collection. 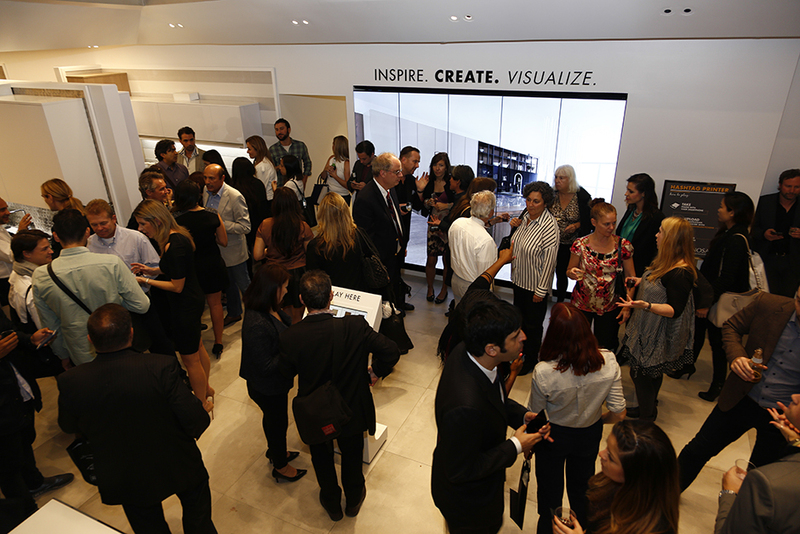 The design consisted of a trapezoid shaped island made entirely out of KRION® Solid Surface Material. 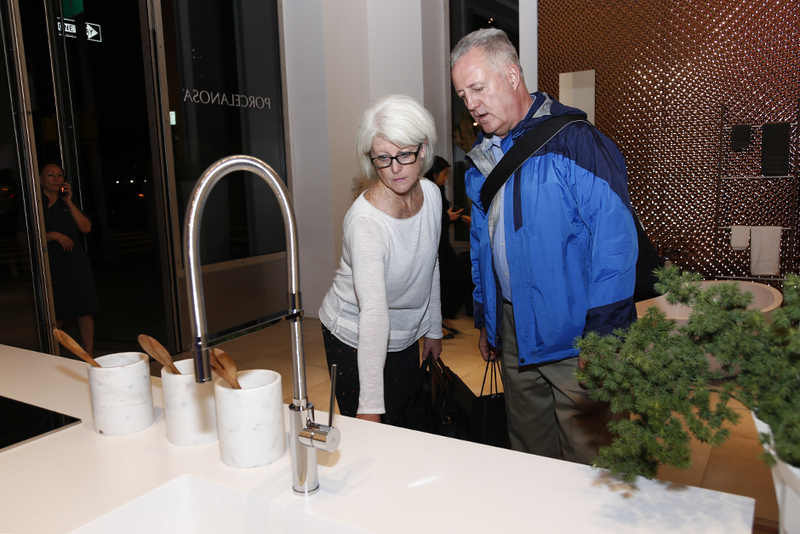 The sink was built in the worktop itself, which has several storage units. 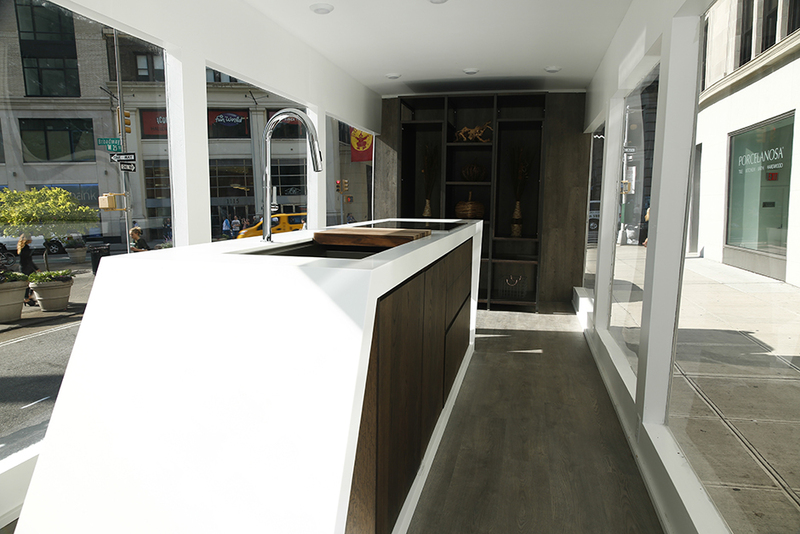 The Emotions kitchen developed for the mobile showcase is the E6.70 model by Gamadecor. 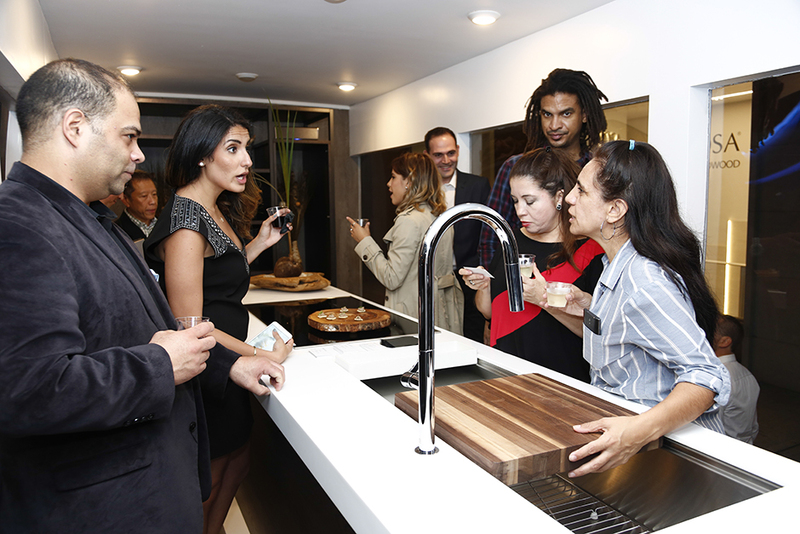 Some of the kitchen’s unique features include a thin matte laquer finish in Roble Cobre, fingerprint-resistant nanotechnology, and soft closing cabinet doors. 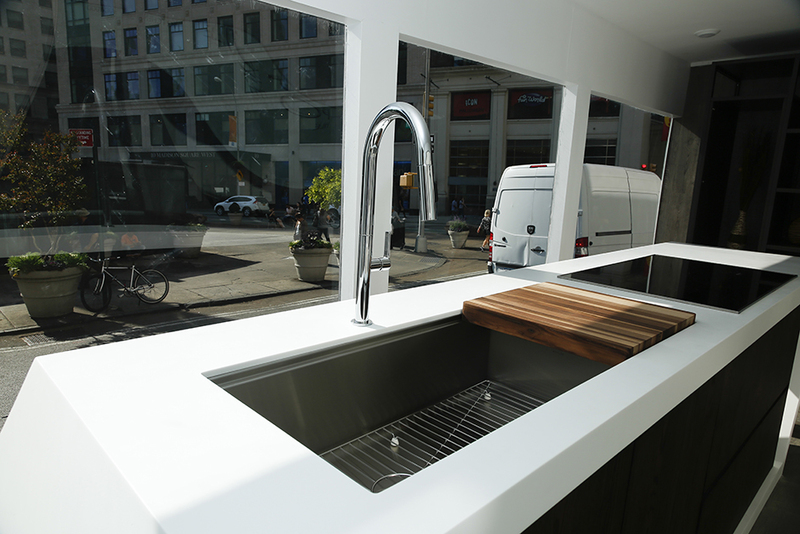 To not interfere with the simple clear lines of the kitchen, the aluminium handles are concealed within the door frames – providing this modern kitchen with minimalist aesthetics. 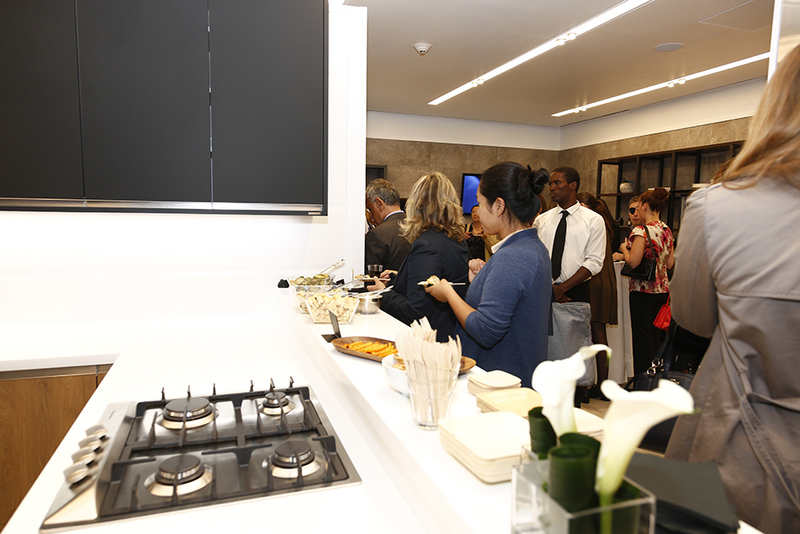 The Emotions kitchen collection by Gamadecor combines functionality and design together with avant-garde materials – resulting in an aesthetic proposal which adapts to the real needs of the user: an ergonomic design, high quality materials, larger storage capacity, scalable storage options, sliding working tables…, all together with numerous exclusive designs thanks to a wide range of finishes and a selection of more than 60 colours. 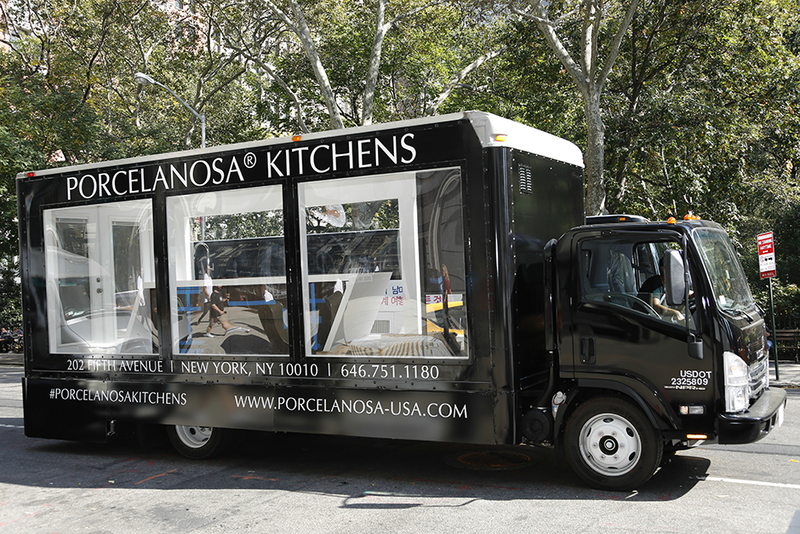 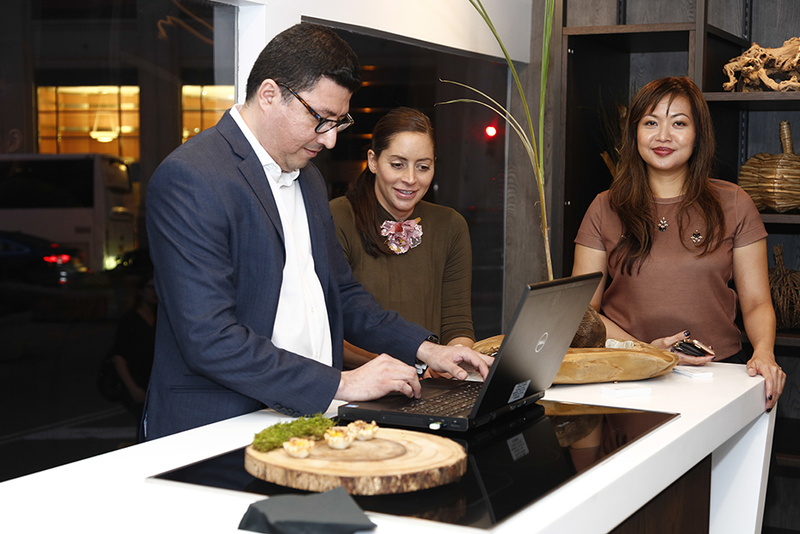 Porcelanosa developed the concept of the Mobile Kitchen Showcase to promote their newly redesigned kitchen studio – located in the ground floor of their New York Flagship showroom. 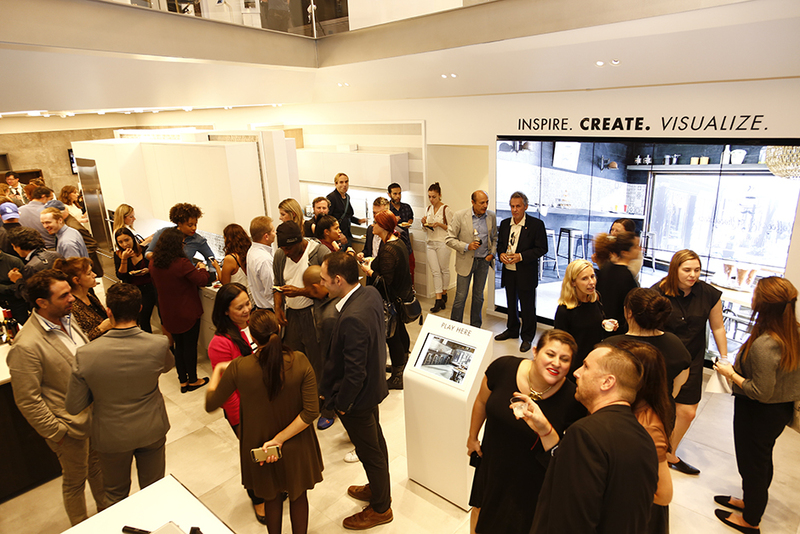 The kitchen studio features seven unique kitchen layouts, and gives customers and clients an insight to Porcelanosa’s various kitchen design capabilities. 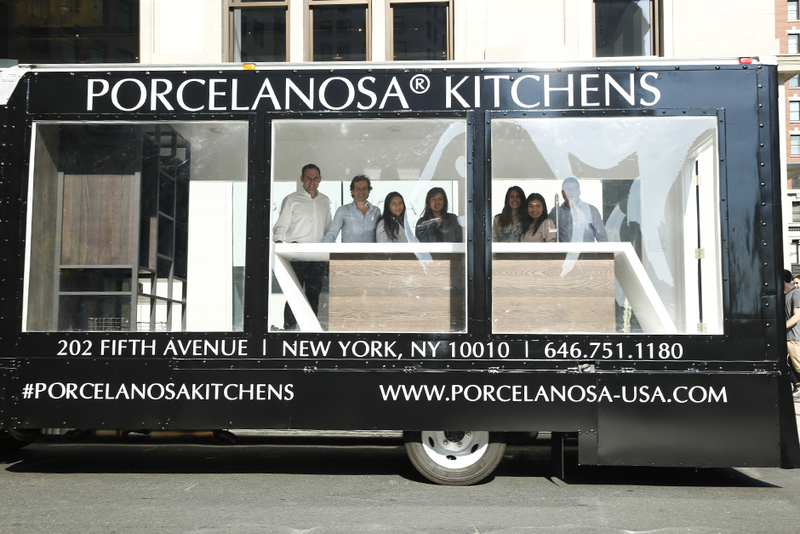 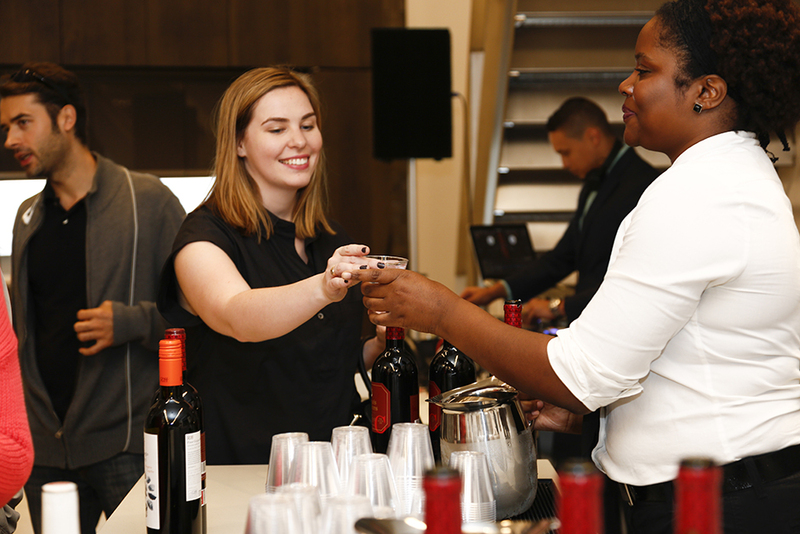 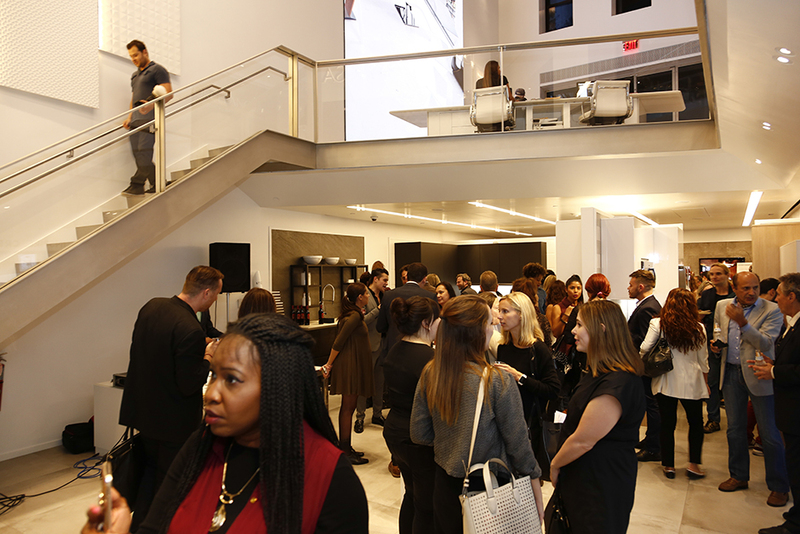 In addition to the Mobile Kitchen Showcase, Porcelanosa also held an event in October 20, 2016 at the New York Flagship showroom for clients, industry professionals to tour the kitchen cellar and step into the Mobile Kitchen Showcase.